If you have a busy calendar with many events, it can be overwhelming to have all events displayed. With Teamup, you can use filters to see a specific event, using keywords or sub-calendars or custom event fields to filter for the events you need to view. You can also use a combination of filters. Teamup’s filtering capability allows you to filter events by keywords and by sub-calendars. 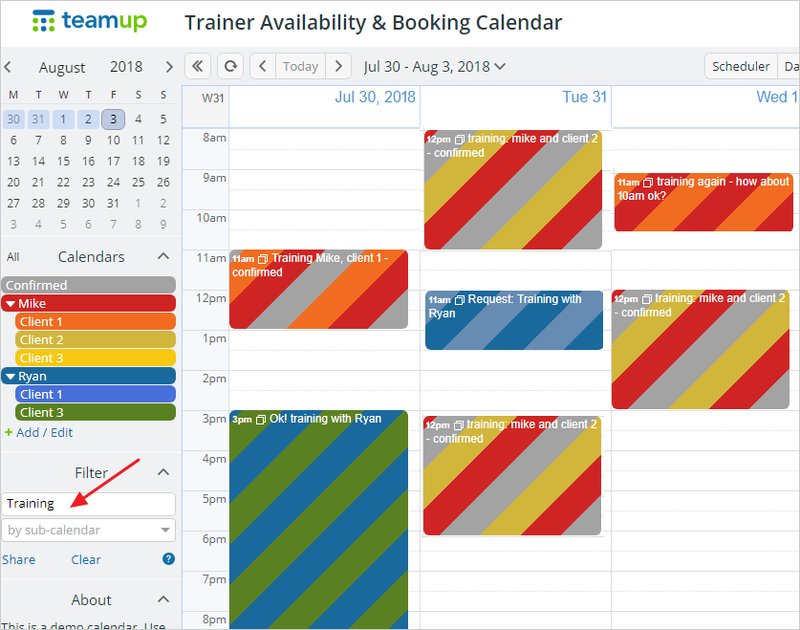 The picture below demonstrates how to filter all training plans on a team calendar by the keyword training. Remember that this filter applies only to the events on your screen. It does not filter all events in your calendar. For example, perhaps you need to know how many of your team members have approved vacation plans during the next 4 weeks. First, alter your calendar display to show 4 weeks worth of events. Do this by switching to the multi-week view (set to 4 weeks in settings) or append ?view=mw4 to your calendar URL. Then enter ‘vacation’ in the keyword filter. When multiple keywords are entered, the OR logic is applied, not the AND logic. This means that if you enter two keywords, the filter will produce results that provides either one of the keywords in the filter, or both of them. That is why the filtered results are expanded rather than narrowed by using multiple keywords. The sub-calendar filter appears below the keyword filter; it also applies only to on-screen events. In the example listed below, you may like to see only Mike’s schedule: to do so, simply choose Mike from the drop-down arrow in the sub-calendar filter. If you have added a custom event field to your Teamup Calendar, a third filter will be available on your calendar. You will see it below the sub-calendar filter. The filter will have a drop-down menu showing the choices for the custom event. A filter for sorting events by custom event field choices. You can add more than one choice from the custom event field to the filter. 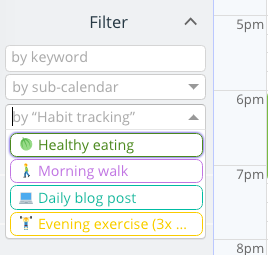 For example, you could filter events by both “Healthy eating” and “Morning walk” choices shown in the example above. To filter by custom event field, use the drop-down menu or enter text into the filter and select the option you want to use. You can use a combination of filters, as needed, to see precisely the events that are relevant. For example, you could filter with a keyword such as vacation and choose to filter by Mike’s sub-calendar. This filter combination will show on-screen events from Mike’s sub-calendar that include the keyword vacation. You can share a calendar view with filtered events: click on the Share link, which is underneath the filters. This will open up your calendar in a new tab or window with the filters applied. You can bookmark that calendar link, or share it with others to see the filter applied. Be sure that the link you use for filtering has the appropriate access permission for the people you want to share the filtered results with. It’s a good idea to open your calendar with a read-only link, apply filters, and then use the Share link to ensure that no one can alter or delete calendar events. Alternatively, you could share how to filter and let everyone filter from their own calendar link.